By now, many of you have already heard that the 2015 runDisney Wine & Dine Half Marathon had a little bit of pre-race excitement. I myself have read several accounts of what happened (some of which were written by people who I know were not even there), and to be honest, I found that many of them did not accurately convey what happened. So, here is my firsthand account and impressons of what some have termed the “great evacuation,” but I simply viewed as another opportunity for Casual Runners to heed our mantra: Accept. Adjust. Advance. A look at the weather alerts from the night of the race. Don’t worry…Yes, I will have a full race review (so stay tuned!). 2015 was to be my third time running the runDisney Wine & Dine Half Marathon in Walt Disney World (you can check out my reviews of the 2013 (Part 1 & Part 2) and 2014 (Part 1 & Part 2) races), and you may have guessed – because I have made no secret about it – that this is one of my favorite race events. Add to this that I would be running with this race with Jennifer, Jake, Candace, and Jenny, and I was as excited as a Casual Runner could be for a race. 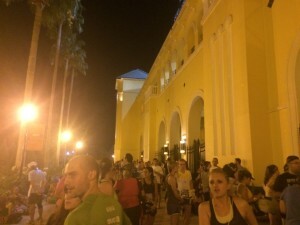 Wine & Dine is a night race that begins at 10 pm at the ESPN Wide World of Sports Complex, then passes throughout Disney’s Animal Kingdom, Hollywood Studios, and Epcot theme parks before affording runners the opportunity to party all night long at the Epcot Food and Wine Festival. Because the 2014 event earned the lighthearted nickname of the Splash & Dash (you really should check out the full review to get it: Part 1 & Part 2), all of us runners kept an eye on the forecast all week leading up to the event. It actually looked pretty good, but in the hours leading up to the start, the forecast started to change for the worse. Many of us feared that this would turn into Splash & Dash Part 2, but, as it turns out, something else entirely was in store for us. As you can see, this was an intense storm cell that should be taken serious, especially in central Florida with its history of lightning strikes. For those of you who do not know, central Florida has the unfortunate distinction of being an area where lightning strikes are not uncommon and come with great risk of injury. For this reason, Walt Disney World has detailed procedures for keeping guests safe, and they take these very seriously. The storm front that approached the more than 20,000 runners, volunteers, and cast members that night produced significant lightning strikes. 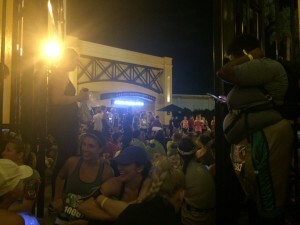 As such, runDisney implemented their emergency procedures and directed everyone (who were all standing outside in the pre-race areas) to seek shelter in the sports stadiums at the ESPN complex. Now, this is where social media may have gotten the best of itself. While this technically was an evacuation, there was no cause for alarm. 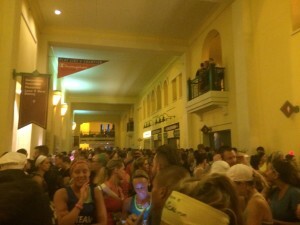 runDisney executed an orderly, calm, and efficient relocation of all participants indoors. At no time did I feel any sense of danger or worry, and my fellow runners were the face of calm. Were people annoyed at the inconvenience? Sure. Did anyone panic or show concern or worry? Not that I saw. Everyone just did as they were instructed and relocated. Many runners had already given up their smartphones (they were in their gear check bags) and so they had no way to communicate with friends and family, but everyone was eager to share phones with fellow runners so calls could be made and weather apps could be tracked (when data coverage allowed). People pretty much took it all in stride. We even tried to keep people updated via our own Twitter feed to ensure that accurate information regarding the situation was being provided. Runners proceeding in a calm and orderly fashion to the designated shelter areas. After about an hour we received word through the jungle drums that we would indeed be allowed to run, and about 10-15 minutes later we were making our way to the corrals. We had another hold up for about 10 minutes as we waited for race officials to give the all-clear to actually enter the corrals, during which time volunteers informed us that the event would be shortened from 13.1 miles down to under 7, however no definitive course route or distance was provided at this time. It was only once we were loaded in the corrals that the event announcers provided us with some additional details as to the changed course, but still we did not receive definitive distances or course directions. According to my watch, the wheelchair athletes were given the go at 10:58pm, with Coral A following about 2 minutes later. Thus, after all of this, the race was only delayed by an hour. What I saw was not only calm and willing accommodation by most runners to go with the flow, but the exemplification of what we at Casual Runner preach as the number 1 rule of race days: Accept. Adjust. Advance. For those runners who ascribed to this mantra, despite the inconveniences, a wonderful race experience – albeit a shortened one – awaited them beyond the starting line. Runners waiting out the storm in the baseball stadium concourse. Now, to address the white elephant in the room. From a vocal minority, conspiracy theories did pop up as to why runDisney shortened the race, and some runners demanded refunds as they were denied the opportunity to run a half marathon. But I see things much differently. I think the runDisney team should be commended for their handling of the situation. They had contingency plans in place and did their best to execute them. Was there room for improvement? Sure, there always is. They did need to do a better job communicating updates to runners in real time (updates were going out via social media, but, as I indicated earlier, many runners had already placed their phones in gear check and thus did not receive them, plus cell and data coverage in the Sports complex was awful due to the large crowds and demands on the network). But what should be remembered is that they did their best to allow us all to do what we wanted to do: to safely run a race. 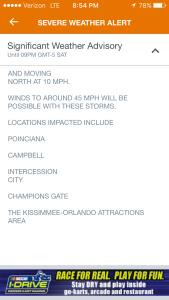 I have no direct information as to why the course was shorted (though many theories did surface), but I can tell you from what I observed that the Animal Kingdom portion of the original course was directly in line with the path that the storm front was progressing. Additionally, as we made our way west on Oseola (in the direction of Animal Kingdom) during the race, I witnessed significant lightning activity in the direction. Waiting out the storm was actually SHORTER than the standby line for Toy Story Midway Mania and Soarin. 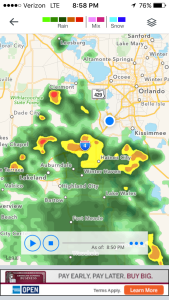 Even though we did not experience any adverse weather once the race began, had the storm front not turned, shortening the course would have allow runDisney to get runners on and off the course faster to avoid any risk of injury. I am convinced that runDisney made the right calls to balance runner safety with the desire of the runners to run that night. On that night I was reminded of a story from the 1960 Winter Olympics, where Walt Disney himself served as the head of the Opening Ceremonies. The hours leading up to the Ceremonies were marked by terrible weather that threatened the Ceremonies themselves. However, just before the Ceremonies were to start, the weather suddenly and dramatically improved, revealing perfect skies for the glorious event. Afterwards, the delegation from the Soviet Union approached Walt to ask him how he managed to manipulate the weather the way he did, for they did not understand that not even Disney magic can control the weather. This is an important lesson for us all to keep in mind on race days. While we cannot control every aspect of the race, we can control how we deal with unforeseen circumstances. We can either let those circumstances ruin our experiences, or we can Accept, Adjust, and Advance. Great post! I completely agree. I didn’t let the shortened course bother me and ended up having a great race. Instead, I look at Wine and Dine 2015 as a great story to tell. I also must commend Disney for the way they handled things. Moving 20,000 people in a short span of time is no easy task. It all went so smoothly and efficiently.